Custom slipcovers can change the look of a room instantly and extend the life of your upholstery. You can express a different style or color palette easily, and then change it back again, if desired. When the kids are home for summer, slipcovers are ideal. You and your furniture can be as relaxed as they are. Slipcovers are also wonderful for vacation houses and rental homes. Textured fabrics add visual interest and resist wrinkling. Consider twills, rep weaves, damasks, denims, cotton duck and sailcloth. Linen and linen blends are guaranteed to wrinkle, which may be desirable. Slipcovers should be tightly constructed in a color that doesn't reveal the upholstery underneath. Slipcovers can be short and flirty. You'll save on fabric if your sofa is suited to a slipcover without a skirt, or if a dining chair can be made with a short skirt. Wing chairs can also be slipcovered without a skirt. 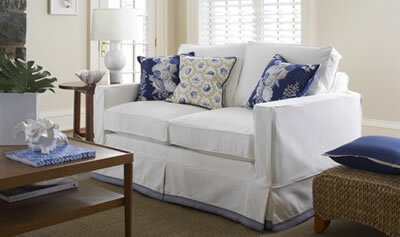 Slipcovers can fit like a glove or be relaxed for a casual look. Be sure to specify the look you want. Your slipcover will be cut and fit in your home, so you won't be without the use of your furniture. 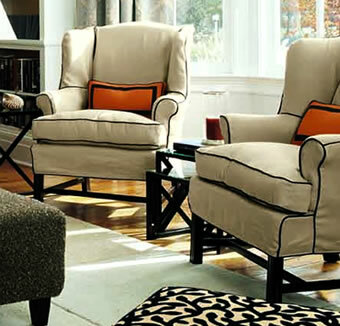 Slipcovers should be dry-cleaned to prolong their life and appearance. This will preserve the hand of the fabric and reduce the risk of shrinkage. A wet slipcover is very heavy and stresses the seams. These estimates assume that the slipcover will be made with self-welting and a skirt.Separate estimates can be provided for contrast welting.